The rutabaga (Brassica napus) or swede is a root vegetable that originated as a cross between the cabbage and the turnip. Rutabagas are only called rutabagas in the United States but are known as Swedes throughout the rest of the world. The rutabaga (Brassica napus) or swede is a root vegetable that originated as a cross between the cabbage and the turnip. 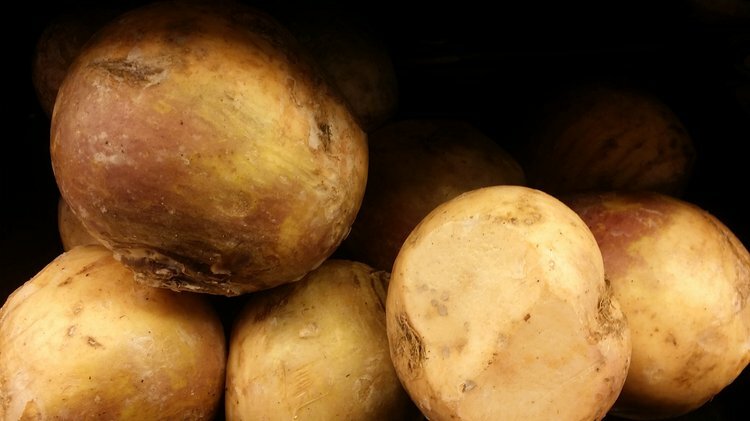 Rutabagas are only called rutabagas in the United States but are known as Swedes throughout the rest of the world. Rutabagas are often confused with turnips despite the noticeable differences. Rutabagas are larger, part white and part purple, with creamy orange flesh and ribs near the stem, and with a sweet flavor when roasted. On the other hand, turnips are white with a purple-red top and a peppery taste. Here are the 7 health benefits of rutabagas. 1. Rutabagas can help you fight cancer along with your treatment. Rutabagas contain the sulfur-containing antioxidant glucosinolates, which has shown to reduce the growth of cancerous tumors. Also, rutabagas contain carotenoids and vitamin C to fight free radicals that prevent the mutation of healthy cells. 2. Rutabagas can help prevent premature aging. Rutabagas are effective in fighting free radicals. This has the potential in preventing premature aging, improving eyesight, and stimulating healthy regeneration of cells throughout the organs and tissues. 3. Rutabagas could improve the immune system. One serving of rutabagas possesses 53 percent of vitamin C. Vitamin C could stimulate the immune system to produce white blood cells. 4. Rutabagas can help improve digestive health. The rutabaga contains a sufficient amount of fiber. A one-cup serving of rutabagas contains 3 grams of dietary fiber. The daily recommended dietary fiber intake for men and women are 38 grams and 25 grams, respectively. Fiber can help prevent constipation, making one’s bowel movement more regular. 5. Rutabagas could fight high blood pressure. Rutabagas are high in potassium and low in sodium, which lowers blood pressure. One cup of rutabagas contains 554 milligrams of potassium compared to 34 milligrams of sodium. 6. Rutabagas can help with weight loss. Low calorie, nutrient-rich foods like rutabagas are efficient weight loss diet plans. High-fiber foods also offer the metabolism and assist manage body weight. One cup of rutabaga contains only 66 calories. 7. Rutabagas may assist in the improved enzymatic function. Rutabagas supply zinc, an essential mineral which for a variety of enzymes. The mineral tends to help strengthen each protein’s overall structure and help support its activity. Gupta, U. C., & Cutcliffe, J. A. (1976). MICRONUTRIENT STATUS OF RUTABAGA, BROCCOLI, BRUSSELS SPROUTS AND CAULIFLOWER AND ITS RELATIONSHIP WITH SOIL p H IN PRINCE EDWARD ISLAND. Canadian Journal of Plant Science, 56(3), 759-761. Shattuck, V. I., Brolley, B., Stobbs, L. W., & Lougheed, E. C. (1989). The effect of turnip mosaic virus infection on the mineral content and storability of field‐grown rutabaga. Communications in Soil Science & Plant Analysis, 20(5-6), 581-595. Mongeau, R., Siddiqui, I. R., Emery, J., & Brassard, R. (1990). Effect of dietary fiber concentrated from celery, parsnip, and rutabaga on intestinal function, serum cholesterol, and blood glucose response in rats. Journal of agricultural and food chemistry, 38(1), 195-200. Fitzgerald, G. A., & Fellers, C. R. (1938). CAROTENE AND ASCORBIC ACID CONTENT OP FRESH MARKET AND COMMERCIALLY FROZEN FRUITS AND VEGETABLES. Journal of Food Science, 3(1‐2), 109-120. Cartea González, M. E., & Velasco Pazos, P. Glucosinolates in Brassica foods: bioavailability in food and significance for human health.